KATHMANDU, April 21: Nepal Stock Exchange (Nepse) benchmark index bounced back 108.16 points this week to close at 1,388.31 points on Thursday, the last trading day of the week. With the rapid recovery, stock market seems to be on a recovery path following a sharp decline last week. The rapid recovery is mainly attributed to the expectations of investors that the lendable fund shortage in the banking industry is going to ease soon. The recovery of stocks has also been supported by the volume of transactions. There has been increase in the number of transactions and turnover this week, indicating that the trading size also went upward due to growing confidence of investors toward market recovery. In recent days, the deposit volume of bank and financial institutions (BFIs) is going up as the spending of the government has been increasing in the third quarter of the current fiscal year. 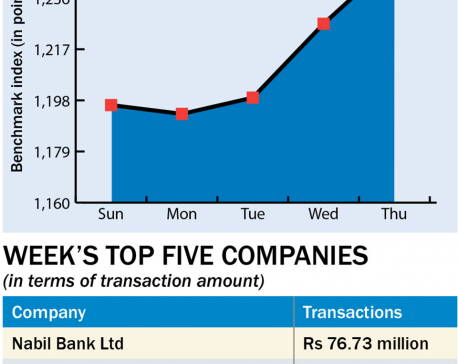 Commercial banks added Rs 72 million in new deposits and disbursed loans worth Rs 68 billion over the third quarter of the current fiscal year. 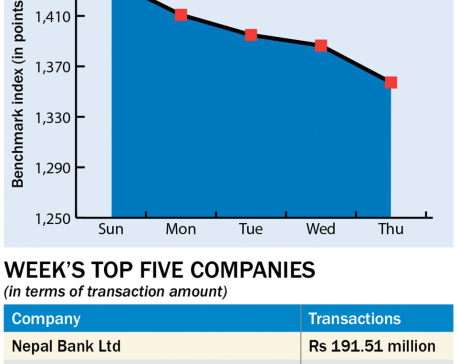 The recent rule of the Nepal Rastra Bank (NRB) to allow commercial banks to bring loans from foreign banking institutions have also lifted hopes among investors that the problem of shortage of lendable fund will end soon. However, interest rates of banks are yet to see the correction. Most of the trading groups ended in the green zone this week with the gain side led by Insurance group which surged with whopping 768.41 points to end at 7,013.33 points. Microfinance group climbed up 211.87 points and ended at 1,701.45 points. Sub-indices of Hydropower and Hotels groups also jumped 205.65 points and 197.14 points, respectively, ending at 1,709.19 points and 2,079.54 points. Development Bank registered a gain of 134.17 points to settle at 1,627.71 points. Manufacturing and Processing group ended 102.56 points higher at 2,363.17 points. Banking, the heavyweight group, also went up 73.88 points to finish at 1,205.67 points. Sub-indices of 'Others' and Finance groups logged a gain of 58.25 points and 40.43 points, respectively, closing at 777.23 points and 686.49 points. Trading group, however, went down 3.38 points to close at 205.98 points. Surya Life Insurance Company topped the list of companies in terms of turnover (Rs 124.2 million) while it was Kumari Bank Ltd that remained at the top in terms of number of number of traded shares (424,000 units). 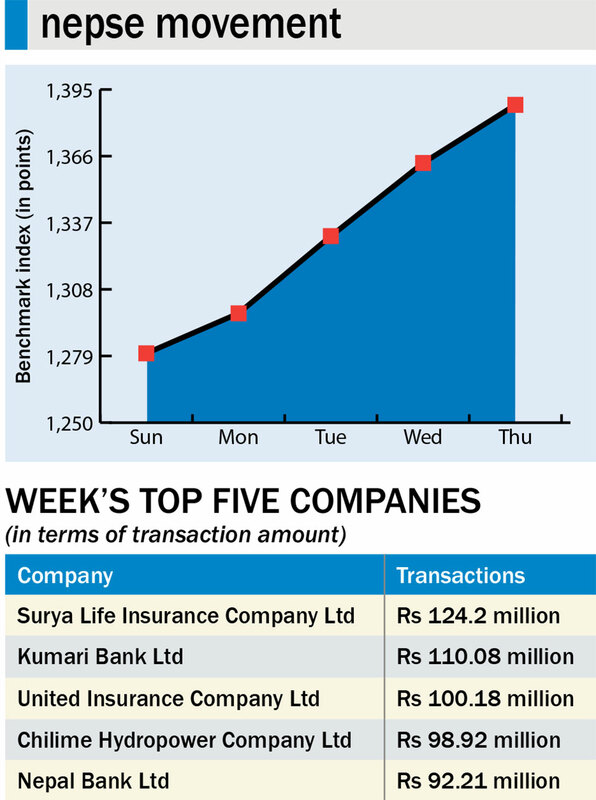 Premier Insurance Company registered the highest number of transactions (1,797) this week. 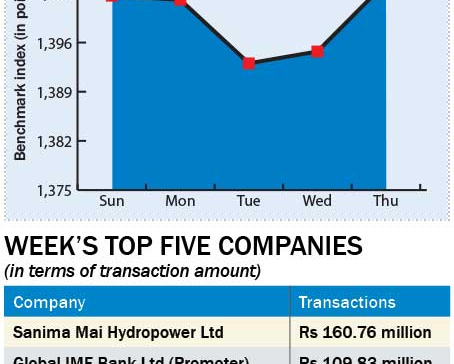 A total of 8.86 million units shares of 181 companies were traded in the market this week through 44,150 transactions. The turnover is 38.46 percent higher than the last week. 'NIC Asia Debenture 2081/82', Citizens Mutual Fund I and NIC Asia Growth Fund were listed in Nepse this week for trading in the secondary market.